Douglas then got Steve involved in the Chapel Choir, where he sang bass for 20 years. Steve also became part of a young mixed quartet, for a few years. In 1985 Govenek Choir were formed, at Penzance YMCA, and he was a founder member. It wasn't long before they needed conducting, and Steve's limited experience in singing was as much as there was available! So began his joy in leading singers. Steve led children's singing groups, and instrumental groups, and began arranging music for them, and for Govenek Choir. In all he led Govenek for over 15 years, and in over 530 engagements, whilst singing male voice all the while. The attitudes and approaches of Douglas Thomas and Ken Northey, MDs at Newlyn, were major influences, during his 24 years in Newlyn. In 2001 Buccas Four, a male quartet from Newlyn, got together. Stephen, David Williams, Graham Warren and Charles Parke have enjoyed many concerts, rehearsals, and social times ever since, and it gives great pleasure to them all. In the same year the Mount's Bay Singers were formed by Sheila Farmer. Stephen has been a cornerstone of the bass section, and deputy conductor ever since. 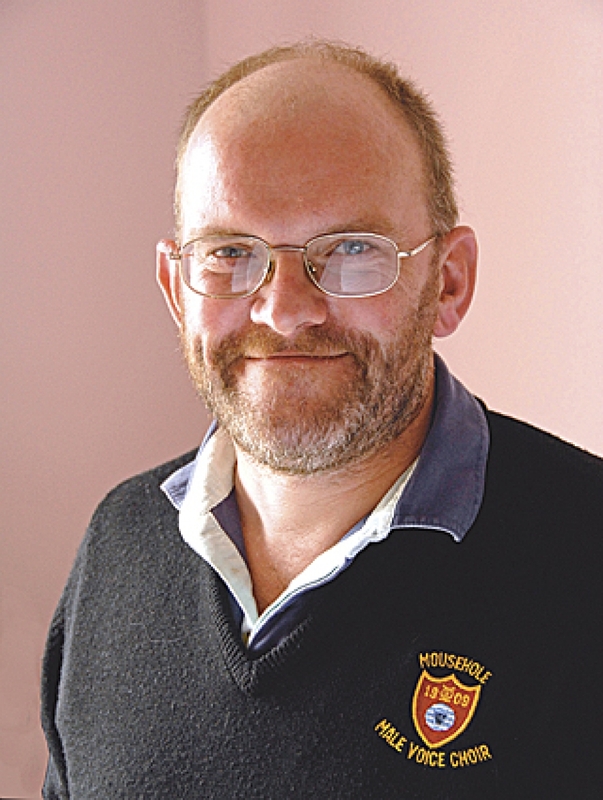 At the end of 2003, when Mousehole Male Voice Choir were looking for a Musical Director, Steve applied, and he has led the Choir since early 2004, maintaining a sense of humour, and a joy in the making of music. His encouraging and positive approach, and the camaraderie and enthusiasm amongst the members, has seen the membership double in his time with the Choir. A feature of Stephen's time with the Choir has been the variety of music which he has introduced, as well as the many arrangements he has written for the Choir, producing a joyful and changing repertoire. He came up with some of the many inspired ideas when Mousehole celebrated their Centenary, and continues to press and encourage the Choir on to great singing, and great events! In the summer of 2008 the Penzance Orpheus Ladies Choir were desperately searching for a musical director, and Steve took them on. It has given him a different challenge, which he has met positively, and the Ladies are now flourishing, with a changing repertoire, and increasing membership. In 2012 Steve was selected, along with three other musical directors, to lead the Cornish male voice expedition to the Royal Albert Hall in London. It was a big honour to be asked to take on this task, and it was amazing how well the 600 men sang after just fifteen bi-monthly rehearsals, at either end of the country. The concert took place in November 2013, and delighted the sell-out audience. Mousehole made the most of visiting London by singing at Southwark Cathedral the day before the combined event. In 2014 Steve was thrilled and honoured to be made a Bard of the Cornish Gorsedd, selecting the bardic name of 'Kessenyans Down', which is 'Deep Harmony' in Cornish. On top of all the musical joys in his life Steve also works full-time for the Cornish Mead Company, in Newlyn. He makes all of their mead wines, bottles it and delivers it. A one man production line! So much joy in life!